I got to thinking: How did the Standard Array come about? I figured they did some sort of simulation. Take 4d6, drop lowest, sort them in order, and take the mean, median, or mode of each row. I wondered, though – what that would look like, and how much variation would there be. I mean, just in my recent character generation forays, I’ve had some really good rolls, and some bad ones. Also, Order of the Stick style, what if 4d6/drop lowest was a metagame universal rule? So that each person that lived basically had that die total. So if you looked at “the upper 20% of adventurers,” you’d see one stat block, “lower 25%” would be the underperforming bandit cannon fodder of the world, etc. Let’s hit it one thing at a time. 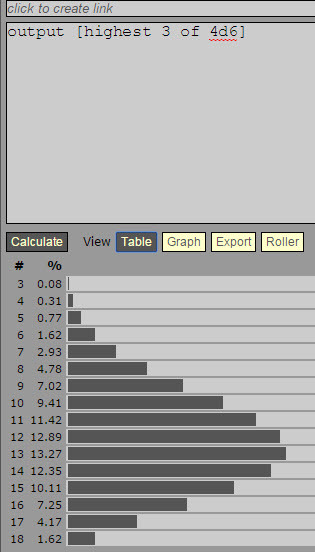 Not being a random number purist, I used RANDBETWEEN(1,6) in Excel to make my die rolls. I took four “dice,” added them together, and subtracted the smallest one. So, what does that look like? Interestingly enough, it’s not quite what the book gives you. Mode: This gives the number that appears most frequently out of 160,000 rolls. Compared to the 5e norm, it is one point better on the bottom two rolls, and you pick up a 16 instead of a 15 for your best. The mode of the full distribution is 13 (from the graph). Median: Line up all 160,400 trials, and give me the average of trial 80,200 and 80,201. The median is also the 50% percentile. This matters a bit because 4d6 drop lowest is going to be weighted slightly to the higher numbers. The median of the distribution itself is 12. Mean (Average): Sum of everything divided by number of trials. 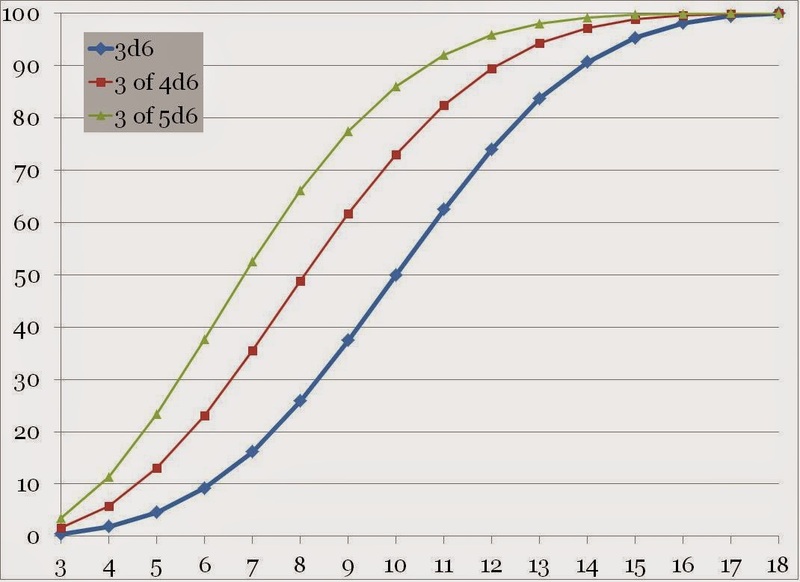 The mean of 3d6 is 10.5, the mean of 4d6 is 14. The mean of 4d6 drop lowest is 12.24. You can reproduce the standard array if you assume you round up numbers that are 0.75 or higher, and round down lower than 0.75. Strict truncation would give you 8, 10, 11, 13, 14, 15. Strict rounding would be 9. 10, 12, 13, 14, 16. That last 16 that appears in all of the above except the actual standard array is important, because in nearly all cases, you can choose your highest stat so that you’re beginning the game with your primary attribute at 18. You may not want to do this, but you can – at least for anything but Wisdom, which for some reason is the only stat you can’t start with a race that gives you a +2. So, if 4d6 drop lowest were a universal law of some sort, what would our percentiles look like? First, why do we care? It’s a tool for GMs to tweak their campaigns. If you think the standard array is too stingy or too rich, you can adjust it. If you don’t want the girl who really lucks out on her rolls (it’s no surprise that out of 160,000 rolls, you can find an array like 16, 16, 16, 17, 17, 18) to overshadow completely the poor schlub that rolled 6, 9, 10, 11, 11, 12, then you can give the same array – for good or ill – to everyone. 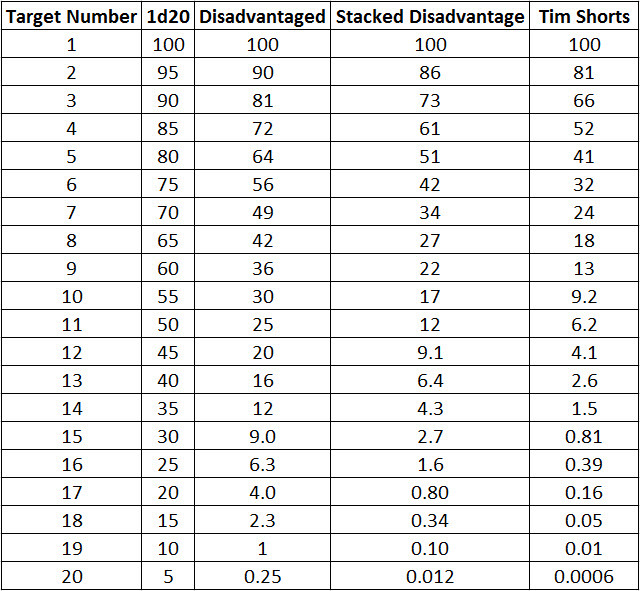 As it happens, the D&D standard array can be matched by assuming that you’re taking the 45th percentile of the array I lined up. So 5% below the median is the “tax” you pay for avoiding the possibility of hitting the 10th percentile. 10th and 25th percentile characters would make good hirelings. Those not quite good enough to venture out as superlative adventurers on their own, but honestly not that bad, either. A 4th level Champion Fighter with 10th percentile stats and the right combo of Feat and Archetype is hitting twice per round at 1d20+5 to hit, 1d8+3 damage each, with AC 17 (chain mail and the boost to AC from Dual Wielder) and 36 Hit Points. That’s a credible mook right there. What does the 90th percentile get you? Mostly, not much – it shores up weaknesses rather than give extra strengths. AC would stay the same (it’s gear-based), throw down half-orc instead of mountain dwarf, and you’re still looking at two attacks, 1d20+6 (only a 5% difference) twice for 1d8+4 (one more point of damage each). You’ll get a slightly higher initiative. Your saving throws will be better across the board. You have 44 HP instead of 36 (that right there might be the biggest difference). In many cases part of the fun of character generation is the choices you’re forced to make. Do you suffer with a -1 or -2 penalty in anything you happen to roll in your “dump stat,” or do you shore up your weaknesses by offsetting them with racial modifiers. If you’re a 90th percentile array human with your worst stat of 12, and highest of 18 – is that fun for you? I can see it either way, and there’s no question that with the proper GM and group, either one could be fun. Overall, I was curious to see how the standard array was calculated. I suspect they picked about the 45th percentile of the 4d6 drop the lowest distribution. Looking again at the 90th percentile human, it would mean you start with a minimum +1 bonus to everything you do . . . and will max out your primary stat at 20 early in your adventuring career if you choose. Even the variant human would start with 11, 12, 14, 16, 16, 18 plus a Feat and an additional Skill – a very satisfyingly awesome character. Though again, getting to high level with some great stats, and some still-poor ones seems like a good “you can’t have everything” challenge. Kinda old school, if you would. Which reminds me . . . what would 3d6 drop-nothing look like by this method? So for +Jeffro Johnson and the 3d6 (in order, no less!) 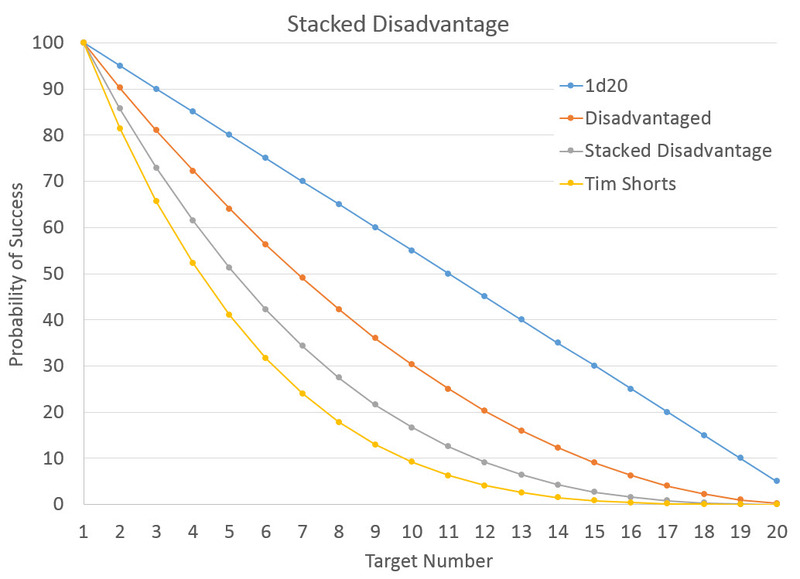 crowd, the current attribute array represents top-quartile type die rolls, and a 3d6 array that mimics the 45th percentile perch of the 4d6/drop lowest method has some tough choices to make . . . and classes that have additional Attribute Increase/Feat options will make a larger difference than those that do not. Because it’s easy, I was asked to drop in 4d4+2. That one will cluster around 12, with more dice providing slightly more variation, and of course a hard minimum of 6.